Lawmakers in San Francisco today will vote on a citywide boycott of the state of Arizona, in protest of its new illegal immigrant law that has spurred a backlash across the country. Arizona Gov. Jan Brewer on Friday signed into law a measure that would require immigrants to carry documents verifying their immigration status. It would also require police officers to question a person about his or her immigration status if there is "reasonable suspicion" that person may be illegally in the country. 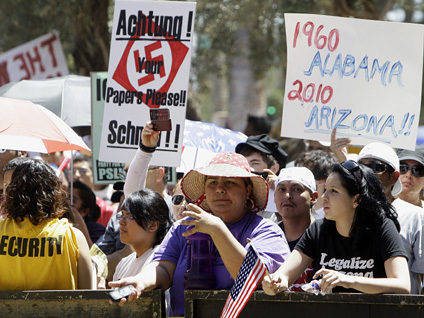 Activists and politicians in Arizona and elsewhere have vowed to continue fighting the law. While it is sure to face legal challenges, Arizona Rep. Raul Grijalva (D) has also called for a boycott of his state's goods, services and tourism. In his call for the boycott, Grijalva cited an Arizona boycott in the 1990's that persuaded the state to recognize Martin Luther King Day. Following that logic, the San Francisco Board of Supervisors today will consider a resolution that would call for the city to end any and all contracts with Arizona-based companies and to stop doing business with the state, the San Francisco Chronicle reports. "We want to send a message," Supervisor David Campos reportedly said to a rally gathered in front of San Francisco City Hall. "There are consequences when you target a whole people." Campos said it's still unclear how exactly a boycott would impact San Francisco, the Chronicle reports, but he added, "We do know that we won't be sending any city employees to conferences in Arizona." San Francisco City Attorney Dennis Herrera seconded the call for a boycott, pledging that his office will help identify contracts with Arizona companies and break them when possible. Arizona Gov. Brewer said Monday at a town hall that she doesn't believe the law is "going to have the kind of economic impact that some people think it might," the Associated Press reports. There has already been some impact, however. As of Sunday, about 70 drivers from California and Arizona had already agreed to stop moving loads into or out of Arizona in protest of the new law, according to the Arizona Republic. Additionally, La Opinion, the nation's biggest Spanish-language newspaper, has endorsed the boycott, Politico reports. New York City Mayor Michael Bloomberg also weighed in on the issue last week with a statement saying the new law "could have a chilling effect on international business travel, investment, and tourism in that state, as many people from around the world may think twice before visiting Arizona and subjecting themselves to potential run-ins with the police." "We're happy to have those businesses and tourists come here," Bloomberg said. "But as a country, America will be badly hurt if more states follow Arizona's lead." Will Arizona's Law Lead to Racial Profiling?